Getting ready for a big trip in a few weeks, been trying to get into shape. Since moving back to downtown Orlando we have no excuse to lazily while away the summer. Charlie can’t run because of a torn Achilles tendon but our local Y provides a ton of other opportunities to get in a workout. My latest HypeOrlando blog is an homage to our area YMCA’s and why they should not be taken for granted. 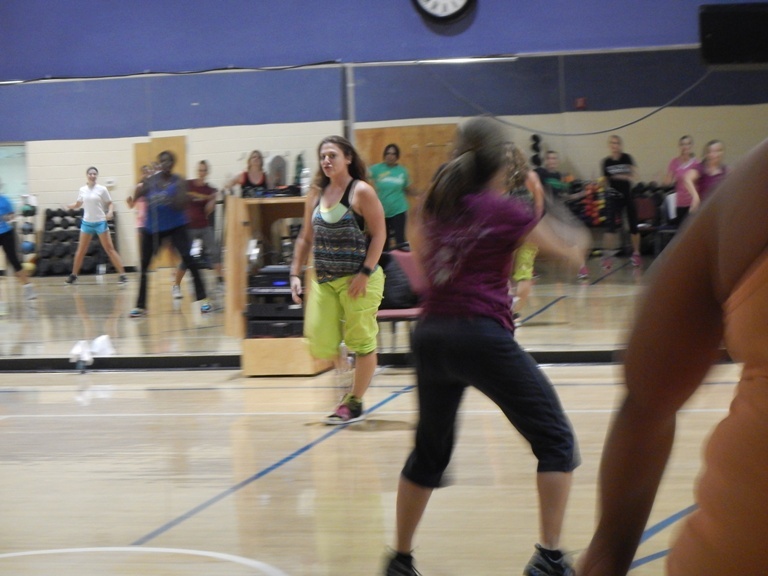 My new passion is the Zumba class which is the best aerobic experience I’ve had in a long time…and I’m not the oldest one there. Has it really been 20 years since I took that dance class and had to learn intricate moves? Those 20 years have wreaked havoc with my brain-foot coordination but fun is had by all and the sweat is proof it’s a great workout. Move over 30 year old hard bodies, make room for grammy! Our leader, Alaina, in a rare moment of almost standing still. This entry was posted in Uncategorized and tagged Achilles tendon, aerobics, Aging, Boomers, dance, downtown, exercise, Florida, hypeorlando, Orlando, YMCA, Zumba. Bookmark the permalink.